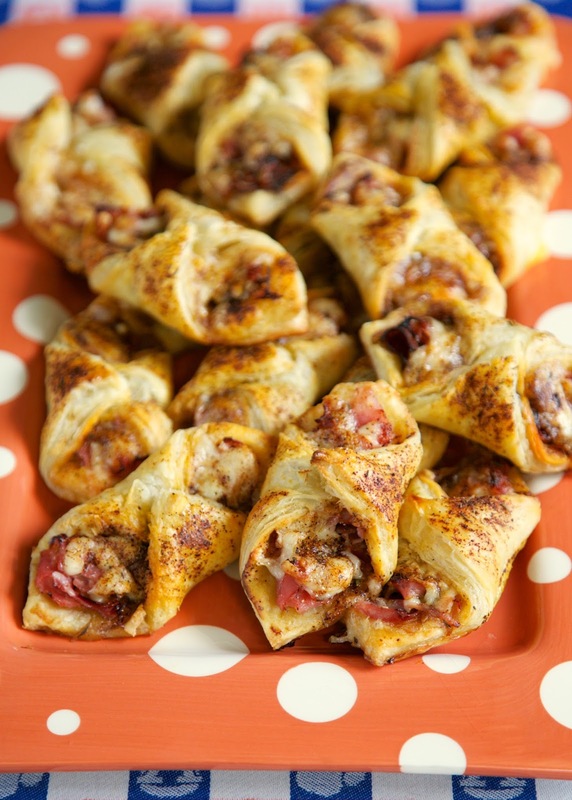 These are easy to make and taste amazing - ham, cheese, and seasoning wrapped in puff pastry - can assemble and freeze for later. These are SO good. Great for parties or a quick lunch or dinner. Are you ready for football??? I am SOOOO ready! I can't wait to see all our football friends. 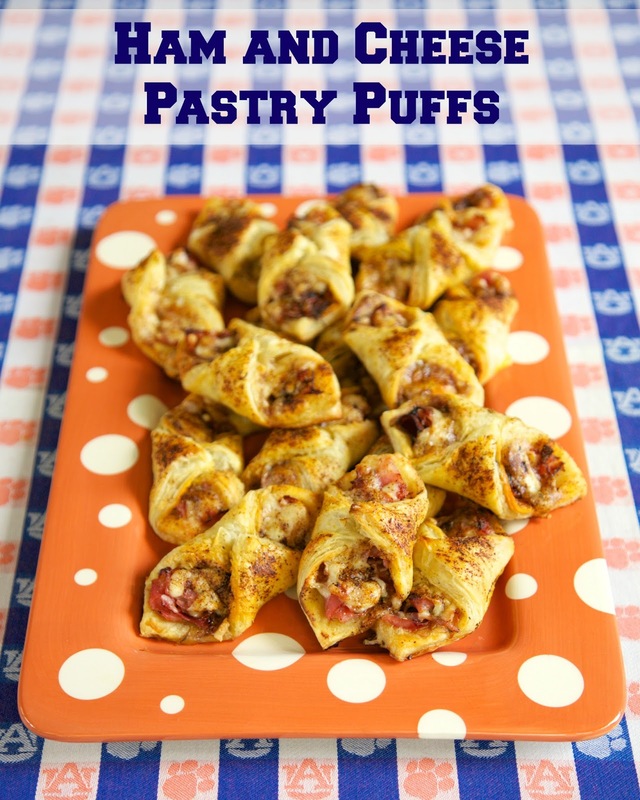 These Ham and Cheese Pastry Puffs are perfect for tailgating. They are bite-sized and travel well. These pastry puffs are good warm or at room temperature. These are easy to make. Cut the puff pastry into squares, top with dijon mustard, ham, cheese, spices and fold up. Easy peasy! I made an animated picture so you can get an idea of how to assemble these. We ate these for lunch the other day and they were AMAZING! The flavors are great. The spice blend that is sprinkled on top of the pastries really puts this dish over the top. I used a combination of swiss and white cheddar cheese. If you don't like either or both of those cheeses, use your favorite cheese. No matter the cheese, these are a sure crowd pleaser! Follow Plain Chicken's board Tailgating Recipes on Pinterest. Spice Blend: Combine all ingredients in a small bowl and mix well. Pastries: Unfold pastry sheets. Cut each sheet into 9 squares. Spread about 1/2 tsp of dijon over the puff pastry. Arrange ham and cheese down center of the pastry squares. Sprinkle with some of the spice blend. Fold two opposite corners of each square over the filling and press edges to seal. Place on prepared baking sheet. Combine egg and water. Brush each pastry with egg wash. Sprinkle tops of pastries with more spice blend. I LOVE the animated pictures, what a great idea! I like using animated gifs for step by step photos like this. Nice touch. Football or no, these sound delish!! And the animated pics are GREAT!! Thanks for sharing!! I think that would work fine. Enjoy! These look delicious! Would you cook them and then freeze them? What temperature and time would you reheat them at when frozen? If you want to freeze these appetizers, would you cook them first? What would the reheating instructions be?